Web Offset Printing provides a combination that is hard to beat in today’s reality; quality printing, competitive pricing and over the top customer service. In the nine years I have been publisher at Tampa Bay Newspapers, we’ve printed heat-set single sheets, tab size newspapers, coupon books and hundreds of other various size publications…with no complaints. Their entire team is there to help, and if possible, make you aware of any cost saving opportunities that might be available. If you expect your finished product to set a high standard in representing your business, then you can trust Web Offset Printing to make you look great." WebOffset printing is a family owned and operated company established in 1994. Since then we have been providing our customers with high quality printing and customer service that is unmatched in the industry. Magazines, weekly newspapers, catalogs and advertising inserts are our specialty. 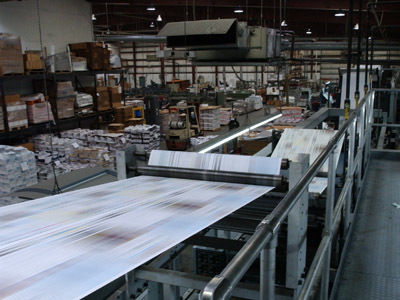 We offer heat-set and cold-set web printing, saddle stitched or perfect bound finishing, inserting and labeling, digital pre-press, and a full service in house mailing department. We specialize in quick turn weekly products and understand the meaning of deadlines. You will not only receive your product in a timely manner, but our quality and customer service is the best in the business. Take advantage of our remote online proofing which allows you to review and approve your job 24 hours a day from any computer with web access. Our proofing is web-based with no software to install. Our recycling and ink choices make WebOffset an environmentally friendly printer. We are committed to engaging in business practices that help preserve the environment and make as little impact as possible. At WebOffset, we go the extra mile. Our phones are staffed 24/7 and the entire team is dedicated to making you look good. Choose WebOffset Printing and experience the difference.